Glisten and shine with this exquisitely designed 18 carat white gold diamond ring from The Forever Diamond. Set with a stunning solitaire diamond, elegant diamond-set split shoulders and a hidden diamond inside the band for added indulgence, this ring is set with diamonds totalling 1/2 carat in weight. The Forever Diamond has a unique 73 facet cut, delivering exceptional sparkle and radiance. Each Forever Diamond has been independently certified for colour, clarity, carat and cut. 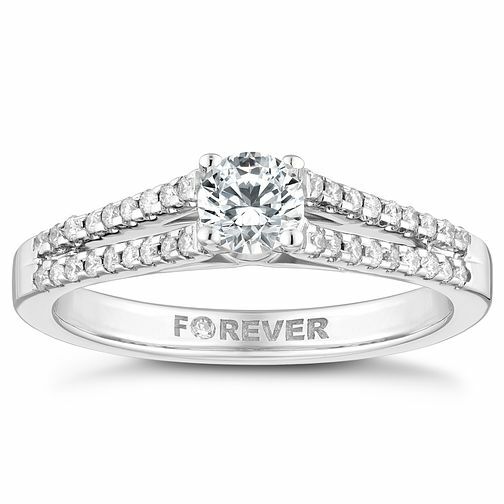 18ct White Gold 1/2ct Forever Diamond Solitaire Ring is rated 5.0 out of 5 by 1. Rated 5 out of 5 by Anonymous from engagement ring Its pretty, has a lovely shape. Looks very unique.